We are recruiting in Calais: apply now! Help Refugees is recruiting volunteers to fill crucial roles for our operation in Calais. Alongside our partners, Help Refugees runs the biggest aid operation in northern France. These roles offer applicants a chance to gain experience working as part of humanitarian response to the worsening situation refugees face in Calais & across Northern France. You will be working from our Calais warehouse, alongside our partners L’Auberge des Migrants, Refugee Youth Service, Refugee Community Kitchen, Utopia56 and Refugee Info Bus, Refugee Women and Children’s Centre and School Bus Project. 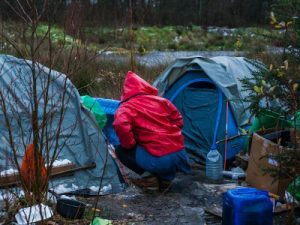 Despite the eviction of the Calais ‘Jungle’ in October 2016 and the Dunkirk/Grande Synthe camp burning down in April 2017, there are still around 1,500 refugees sleeping rough in the forests in northern France. The youngest unaccompanied minor in Calais is currently just nine years old. We welcome applications from all persons regardless of their race, gender, sexual orientation, disability, religion, belief, or age. But, as members of ethnic minority groups, refugee backgrounds and disabled people are currently under-represented at this level, we would encourage applicants from members of these groups. Interviews and role offers will be based on merit alone. If you have any questions, please read the FAQs on our Volunteer in Calais page first. Your ticket for the: We are recruiting in Calais: apply now!